1-1 split for our two leans last night, with Wings/Senators going Over 5 but Canadiens/Panthers falling a goal short of the Over 5.5. The Over 5.5 suggestion in Leafs/Sabres also won, though it took a late goal by Eichel to push the game Over the total despite the Leafs scoring 3 goals in less than a minute in the first period. The Senators earned a big point by rallying from a 4-2 third-period deficit in Detroit, but the 5-4 shootout loss was still Ottawa’s 9th defeat in 11 games. It’ll be really interesting to see if the Sens can ride any momentum from their late comeback into tonight’s rematch with the Wings, or if they’ll continue to squeeze the sticks tightly – especially if Tampa can get a victory in Boston to tighten the race even more. Absolutely massive slate in the NHL tonight with 13 games on the schedule! The red-hot Leafs get a tough test from the league-leading Capitals, the Islanders desperately need 2 points tonight on the road in Nashville, and the 3 late games will all have an impact on the race for the Pacific Division title. It should be great to watch. For the first time in what feels like a long time, we like a lot of the betting angles tonight. There are 3 games that we like the most and rather than decide which one we like most, we’ve listed them all as Best Bets for this evening. Below that are stats, trends, info and opinions for the rest of the games on the board as well. Almost a certain playoff preview between these two division rivals tonight, and there’s a lot at stake. Pittsburgh enters the game with a 1-point lead on Columbus for second in the Metropolitan Division, which would mean home ice advantage in the first round of the playoffs. Both teams should obviously be up for the game, but we like the Blue Jackets in the first period for a couple of reasons. First, the Jackets have been a terrific first period team all season (both at home and on the road) while the Penguins have been outscored in first periods at home this year. Secondly, of these two teams, the Jackets have more to prove than the defending Stanley Cup champions. We look for them to come out with a serious chip on their shoulder, especially early. The Maple Leafs are 8-1-1 in their last 10 games and still find themselves as a home underdog tonight. That just tells you about the greatness of the Capitals, who are on an 8-1-1 run of their own. However, the Capitals have been giving up quite a few goals of late – 15 in their last 4 games, in fact. Grubauer is a decent backup but he’s still not Holtby, and now he’s been charged with stopping a Leafs attack that is playing with tons of confidence, scoring 3 goals or more in 4 straight games and 7 of its last 8. This is also Washington’s final game of a long road trip, always a potential letdown spot, and the Caps have pretty much locked up first place in the NHL already. 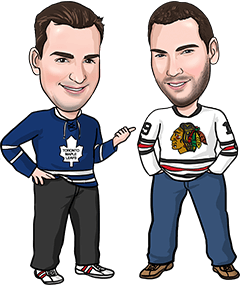 With the way the Capitals are scoring themselves (3+ in 5 straight and 7 of 8) and McElhinney in net for Toronto, we’re still a bit hesitant to bet against them with a Leafs moneyline play. But we definitely like Toronto’s chances of scoring at least 3 or more in this one, and won’t be surprised to see the Leafs pull off the outright upset. The Coyotes might look like they’re “hot”, beating the Capitals 6-3 Friday at home and then beating the Kings in LA on Sunday, but the stats tell a bit of a different story. Arizona’s been outshot by 20 shots or more in 3 straight games, and that spells trouble against a Dallas squad that has underachieved overall this year but is playing with a lot more life of late. Dallas’ biggest improvement has been on the defensive end, where they’ve held opponents to 2 regulation time goals or less in 6 of their last 8 games. Arizona’s struggling to score again, managing 3 goals just twice in its last 9 outings. And defensively, Arizona had allowed 3+ goals in 9 straight before Sunday’s 2-1 win over the offense-starved Kings. Dallas hasn’t been lighting up the scoreboard recently but the Stars are much lower scoring on the road, and now they’re back at home where they’ve averaged 3.16 goals per game. Throw in the fact that Arizona has lost 8 straight trips to Dallas, with those last 3 defeats coming by 3 goals or more, and it seems pretty likely that the Stars can get the job done in regulation time here. Reasons to bet Philadelphia: The Flyers have won 6 of their last 9 games and held opponents to 2 goals or less in 5 of 7. New Jersey has lost 7 of 9 and been held to 2 regulation time goals or less in 7 of 8. Reasons to bet New Jersey: The Devils have won 3 of 4 meetings this year with Philadelphia, 7 of the last 10 and 18 of the last 25. Philadelphia has lost 20 of its last 26 road games. Reasons to bet Tampa: The Lightning is 5-0-1 in its last 6 and desperately needs 2 points as it continues to chase down a playoff spot in the East. The road team has won 7 of the last 8 meetings in the series. Reasons to bet Boston: The Bruins have won 5 straight games and are 10-3 in their last 13 at home. Tampa’s allowed 3 goals or more in 7 of its last 9 games. Reasons to bet Detroit: The Red Wings beat Ottawa 5-4 in OT last night in Detroit for their third straight win over the Sens this year and 6th in the last 7 meetings. Ottawa has lost 5 straight and 9 of 11, and is feeling a lot of pressure in the tight playoff race. Reasons to bet Ottawa: The Senators are obviously motivated to get a victory with their playoff spot in jeopardy. Detroit has not won in regulation time in its last 9 games. Reasons to bet Carolina: Despite losing their last 2 games, the Hurricanes are still 9-2-4 in their last 15 games. Minnesota has lost 10 of its last 13 games and allowed 3+ goals in 7 of its last 10. Reasons to bet Minnesota: The Wild has scored 4 goals or more in 3 straight home games. The Hurricanes have lost 6 of the last 7 meetings and are 2-7-1 in their last 10 visits to Minnesota. Reasons to bet New York: The Islanders need a victory to keep their slim playoff hopes alive. Nashville has scored 1 goal in 3 of its last 4 games. Reasons to bet Nashville: The Predators have won 5 of their last 6 home games, allowing just 7 goals in their last 5 at home. New York is without Tavares for the rest of the year and has lost 7 of 8 in Nashville. Reasons to bet Winnipeg: The Jets have won 4 straight games and 7 of their last 9, and they’ve defeated the Blues in all 4 meetings so far this season. Reasons to bet St. Louis: The Blues are 12-3 in their last 15 games and still playing for playoff positioning while the Jets are out of the playoffs. St. Louis has held opponents to 1 regulation time goal or less in 5 of its last 6 games and 7 of 9. Reasons to bet Chicago: The Blackhawks are 12-3 in their last 15 road games and have won 6 of their last 7 meetings with the Avalanche. Colorado has allowed 4+ goals in 8 of its last 9 games. Reasons to bet Colorado: The Avalanche has scored at least 2 goals in 4 straight games and 7 of its last 8. Chicago’s given up 3+ goals in 5 of its last 8. Reasons to bet Calgary: The Flames have won 6 of their last 8 road games and are 20-14-4 away from home this year. Anaheim has given up 3+ goals in 3 straight games, 4 of 5 and 5 of 7. Reasons to bet Anaheim: The Ducks have won an incredible 26 straight home games against the Flames. Calgary has lost 10 of the last 11 meetings overall. Reasons to bet Vancouver: The Canucks have won 6 of their last 7 trips to San Jose. The Sharks have lost 8 of their last 10 games. Reasons to bet San Jose: The Sharks beat Vancouver 3-1 Sunday in Vancouver for their 4th straight win over the Canucks this year. Vancouver has lost 8 of its last 10 and scored 1 goal or less in 6 of its last 8. Reasons to bet Edmonton: The Oilers have won 9 of their last 10 games and are 20-13-5 on the road. LA has scored 2 goals or less in 6 of its last 7 games and was eliminated from playoff contention Sunday. Reasons to bet Los Angeles: The Kings have won 12 of their last 13 home games versus Edmonton. LA has held opponents to 2 goals or less in 8 of its last 10.